"The NX Gemini Twin 5.0 plates set the standard for performance in the Ford market, out powering all competitors. NX introduces the next generation in 5.0 plate design, the 5.0 Phase 3 plate without the flow restricting spray bars. These revolutionary plates are available in single or dual stage, Which includes horsepower settings from 50 to 300 on each stage. This design center feeds for ease of jet changes and operate on EFI fuel pressures. No other plate on the market today can match the versatility or performance of the Phase 3. 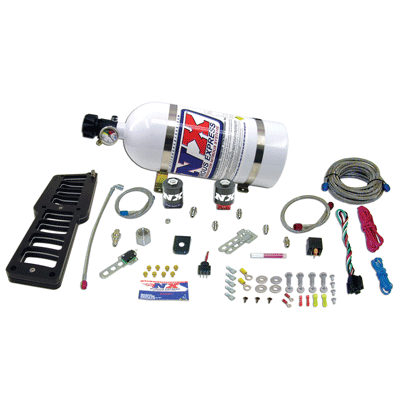 All systems come complete with 10lb nitrous bottle, stainless steel bottle brackets, billet nitrous plate, jetting for 50-350WHP, all installation hardware." 1986 1987 1988 1989 1990 1991 1992 1993 1994 1995 GT GTS Cobra SVT 5.0L V8 Mustang Roush & Saleen Vehicles.